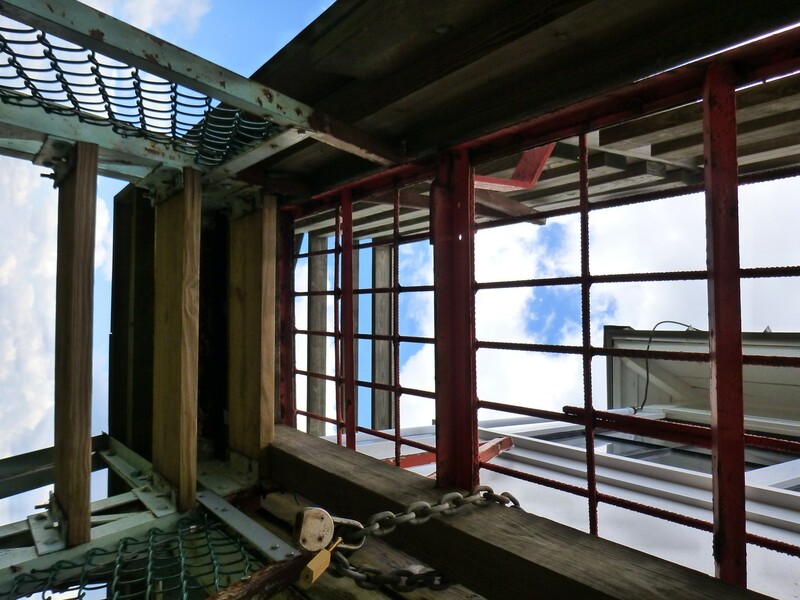 This journey took me to the lookout tower on Teyahalee Bald (also known as Joanna Bald), which marks the northwestern corner of Ash Cove, one of the tracts the Wilderness Society is working to protect. Ash Cove lies north of Andrews at the eastern end of the Snowbird Mountains. Teyahalee (elev. 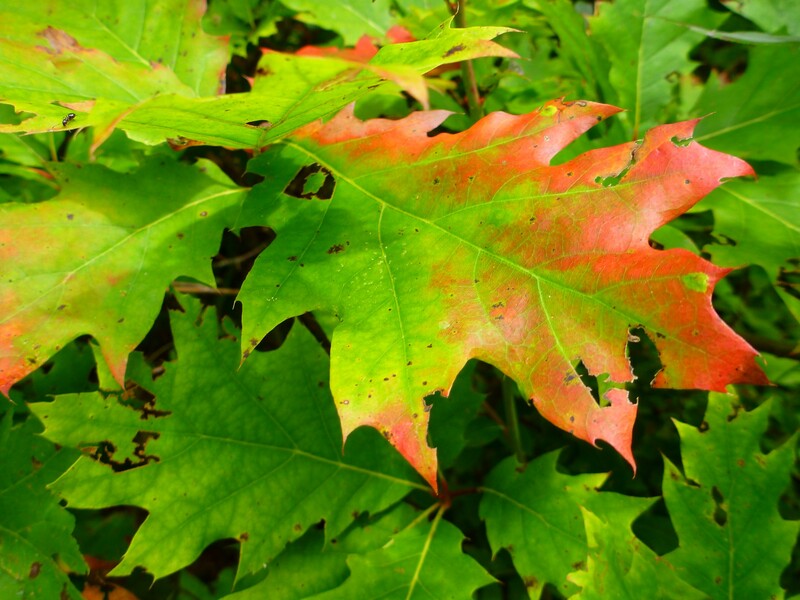 4716′) has, for hikers, two other kinds of significance. 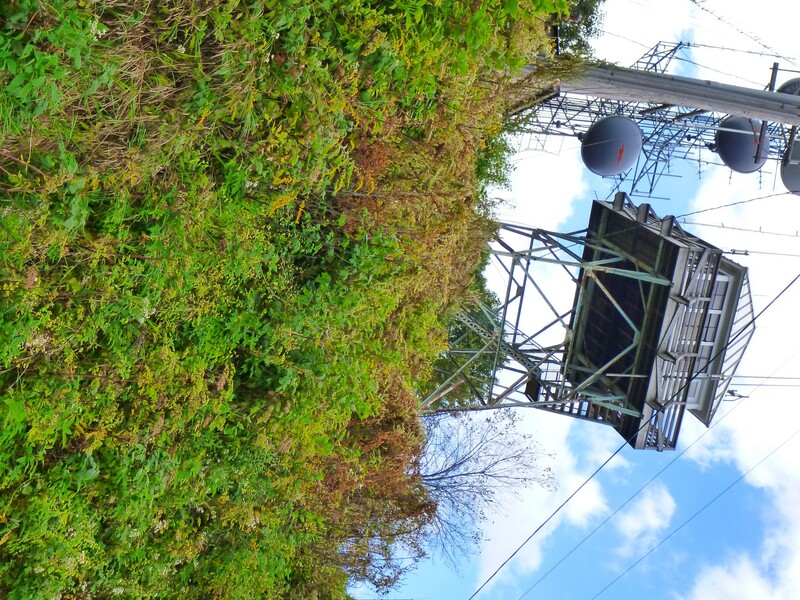 It lies at the end of the now-defunct western extension of the Bartram Trail, and it has a lookout tower on its summit. 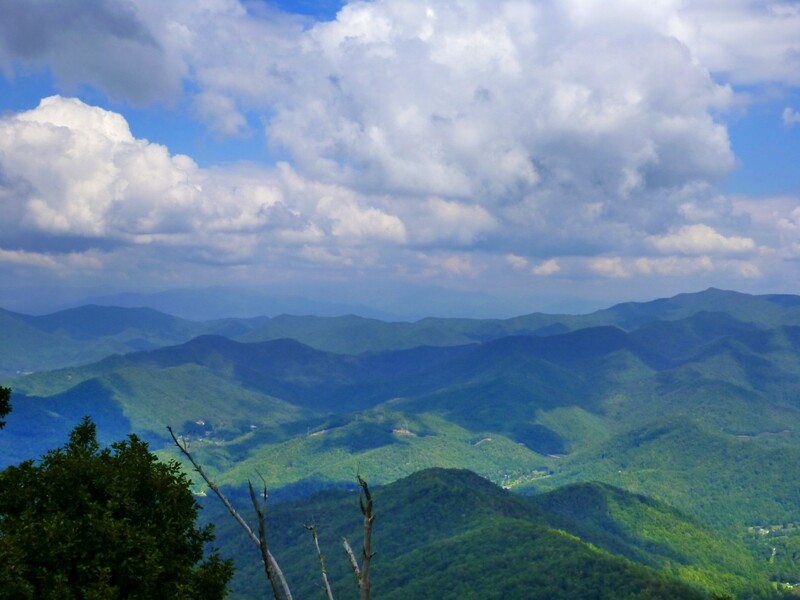 Armed with my friend Peter Barr’s Hiking North Carolina’s Lookout Towers, I was able to navigate my way to this somewhat obscure destination much more easily than I could have with my other tools (DeLorme road atlas, Nat Geo maps, USGS maps). The lookout tower has a cell tower as a very close neighbor. 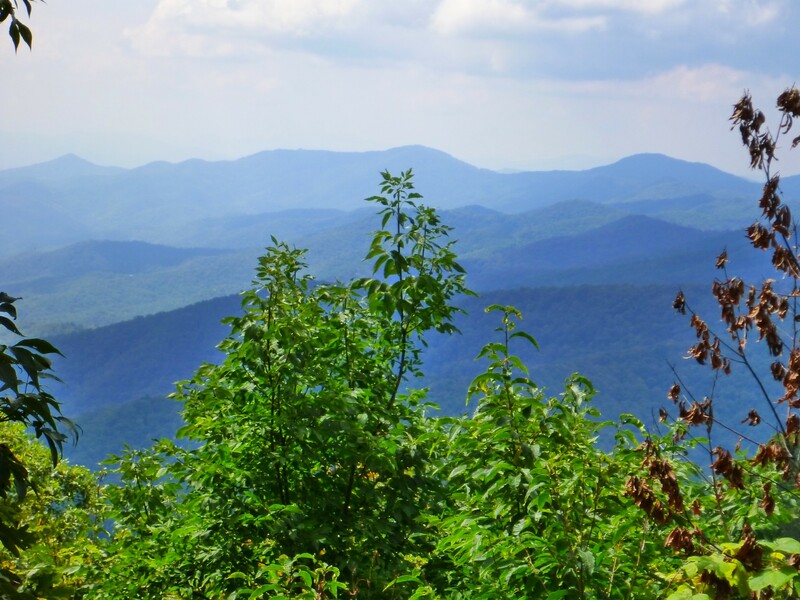 I recommend visiting the website of the North Carolina chapter of the Forest Fire Lookout Association for more information about the state’s 26 towers. Teyahalee actually has yet another layer of significance. 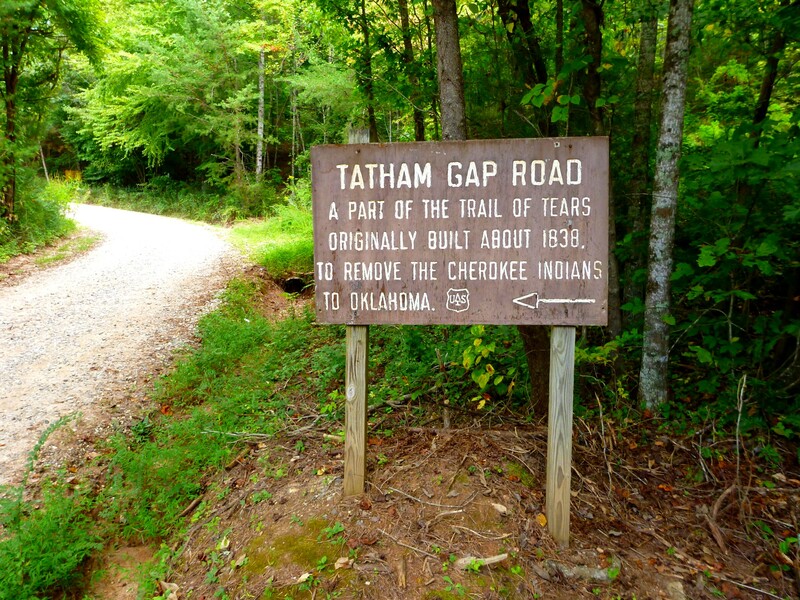 It lies close to Tatham Gap on the Cherokee Trail of Tears. Driving north from Andrews, I stopped at the sign marking the start of the steep gravel section of Tatham Gap Road. I drove slowly up the 4.6 miles to the gap. I think of mountain roads in terms of whether I am mainly in fourth gear shifting down to third for curves and steep hills, mainly in third shifting to second, or mainly in second shifting to first. This one fell into the last category. It switchbacked its way up, occasionally passing steep dropoffs. Sharp rocks in the road brought to mind the possibility of a flat tire, but I was driving toward a cell tower, with the bars on my cell phone steadily increasing—so if I had car trouble I could make a call from this road where hours might pass before another vehicle came by. On the other hand, the price of this communication is skylines marred by towers. It’s a difficult issue. I reached the gap, marked by another sign about the Trail of Tears, this one mentioning that it was forces of Brigadier General Winfield Scott that accompanied the Cherokees on their unwanted journey to Oklahoma. I recalled that he had yet to achieve fame as “Old Fuss and Feathers” in the Mexican-American War and as the author of the “Anaconda Plan” in the early days of the Civil War. Like many officers in the U.S. Army of the 19th century, he was occupied in times of “peace” in actions involving Native Americans. I still had 2.6 miles to go on the side road to the locked gate below the towers. That road was easier to drive. I pulled off to the side below the gate and began my half-mile walk up the road. 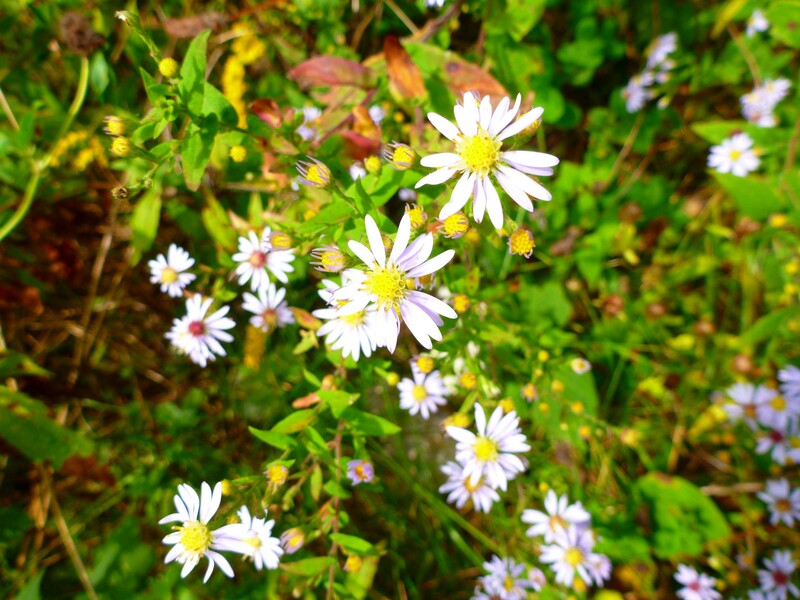 I saw wildflowers along the way. Along the road I had a nice view to the west toward the Unicoi Mountains. As I walked, I knew I would pass the terminus of the Bartram Trail’s west extension. I noticed an unlabeled wooden post that might mark it, but I decided to visit the tower first. I already knew from Peter’s book that I would not be able to reach the catwalk level, but I could still get a view from the stairs. 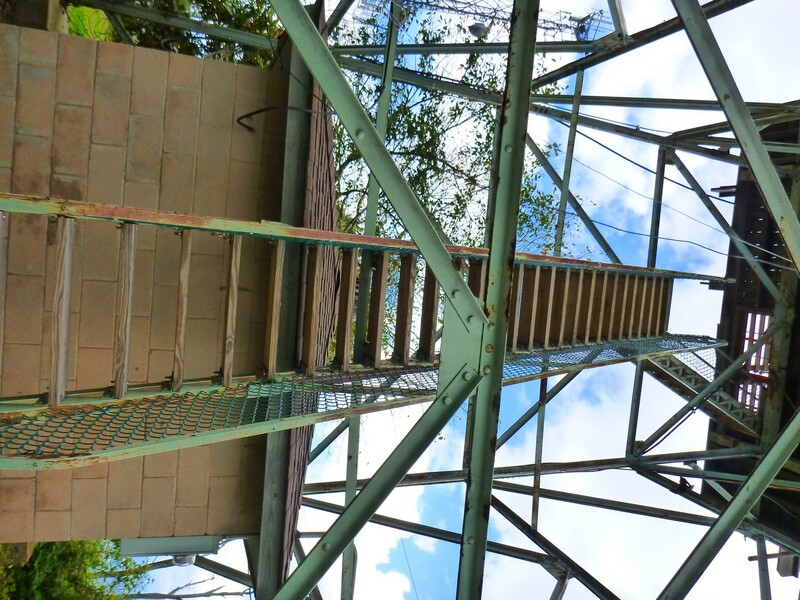 …until I reached the padlocked catwalk. I still had a decent view to the east. A Forest Service employee was doing some work around the towers. He told me he was servicing equipment that monitors air quality. 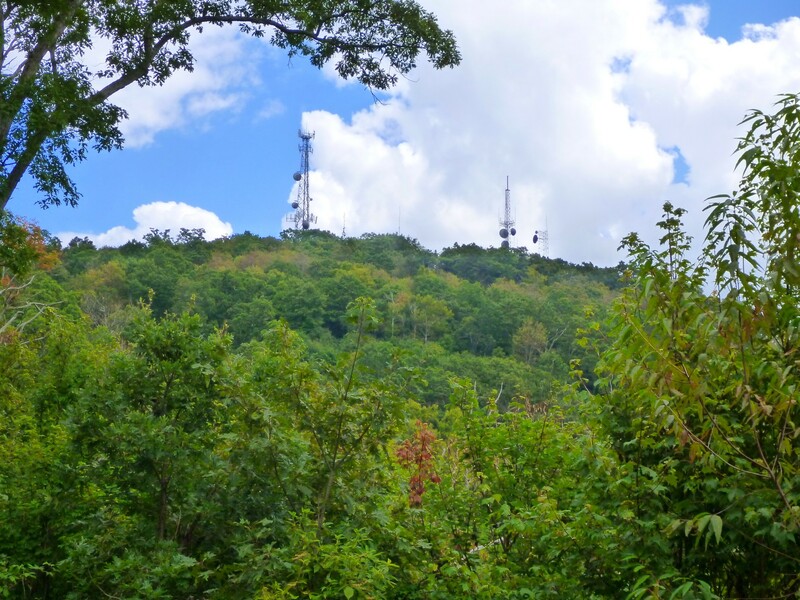 The Forest Service takes advantage of the availability of electrical power at such points to operate the equipment, a fringe benefit of the cell towers that at least does something to offset their intrusiveness in the landscape. I went back to the marker, seeing from the lay of the land that this was really the only possible place the old unmaintained trail could be located—on the ridgeline. 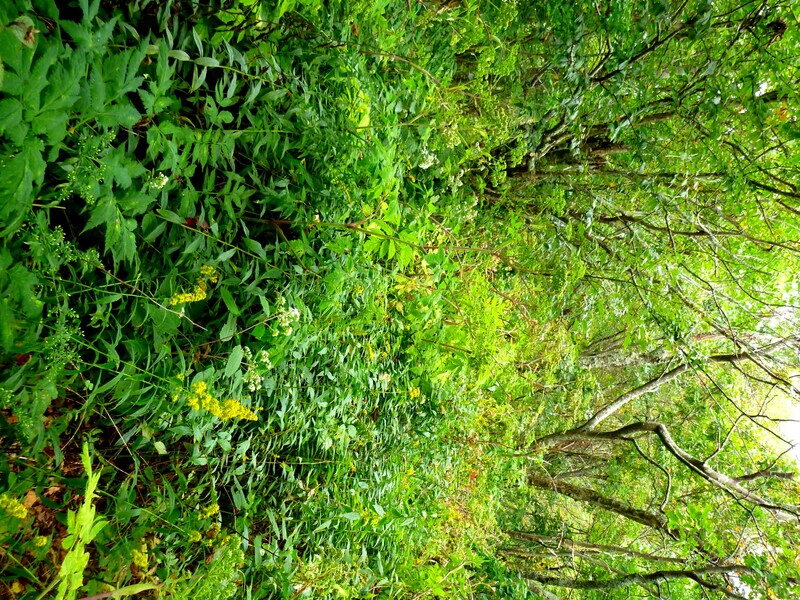 The dense vegetation made the presence of the ridgetop not so obvious as you might think, but I pushed through head-high blackberries and lots of Filmy Angelica to confirm my idea. And I did find the old trail, more by feel than by sight. 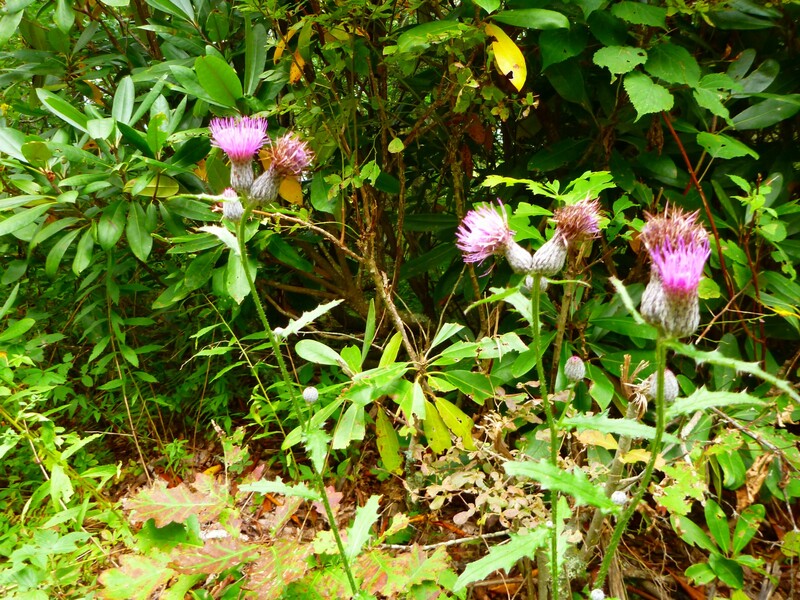 The Cheoah Ranger District of Nantahala National Forest is looking for volunteers to restore the trail, which was abandoned when the Bartram Trail was routed to Cheoah Bald. The Forest Service now calls this westernmost section the Valley River Trail, named after the mountains further to the east. Any volunteers have their work cut out for them. The trail runs right through the middle of this scene, but it’s pretty hard to see! Bushwhacking along the ridge would not present much of a navigational challenge, but long pants and long sleeves are needed. It might be pretty easy in winter. 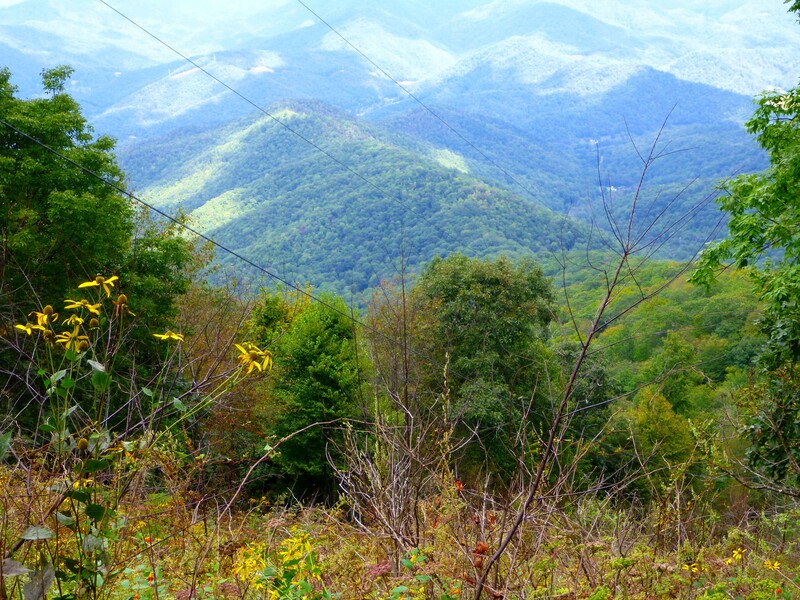 I returned to my car and, once I reached Tatham Gap, opted to go on to Robbinsville rather than returning to Andrews. The distance from the gap into town is 5.9 miles, longer than the route to Andrews, but the road is in better shape and it’s all paved once you get down to a stream valley. And so I drove home to Sylva via Stecoah Gap. Posted by Jenny in history, military history. "The Battle of Chapultepec" by James Walker. This version does not feature Pillow in the foreground. 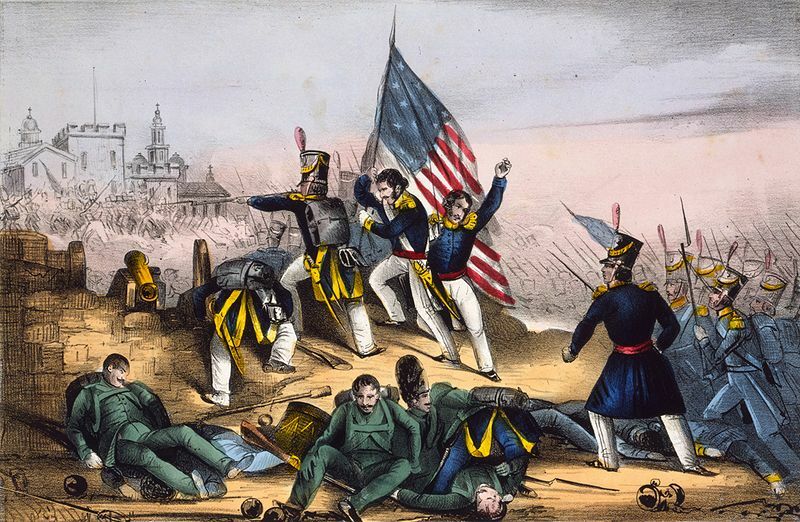 It was October 1847, and American forces had recently vanquished the Mexican defenders at the Battle of Chapultepec. With this victory at the gates of Mexico City on September 13, the war with Mexico was all but over. Our hero, General Gideon J. Pillow, had played a role in the fighting, and he wanted to make sure that the American public knew about it. 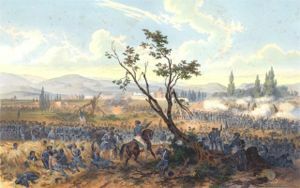 As he recovered from a wound to his ankle received as his forces approached the Chapultepec fortress, Pillow got wind of a painter named James Walker who had been making sketches of battle scenes. And now Walker was preparing to enlarge one of his sketches into a painting. But the problem was that Walker had somehow gotten under the influence of Pillow’s colleague General Quitman, and the painting was going to feature Quitman’s division, not Pillow’s. Something must be done about this! As I described in my last post on Pillow, the general’s participation in the battle featured far more error than glory. Winfield Scott was even more outraged when he learned that very similar articles had also appeared in the New Orleans “Daily Delta” and “Daily Picayune,” as well as one in the Pittsburgh “Post” signed “Veritas.” It was all very suspicious, and soon enough the evidence made clear that Pillow himself had authored the “Leonidas” letters. Pillow was to be active in party politics over the next years, even trying for the vice presidency. But the “Hero of Chapultepec” remained largely in the shadows until the Civil War, when he played a role at the Battle of Fort Donelson. 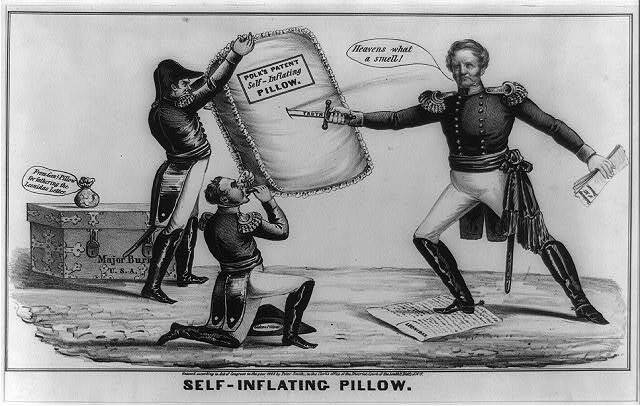 Today’s post concludes our series featuring Gideon J. Pillow, but he will make a cameo appearance in an upcoming post about Ulysses S. Grant and Fort Donelson. The illustration below, from 1847, is by E.B. & E.C. Kellogg. 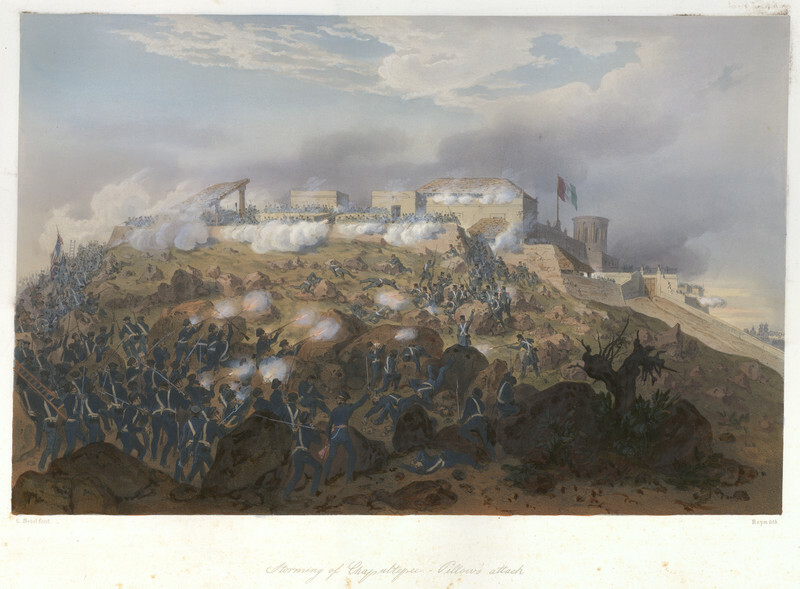 It is titled “Attack on Chapultepec: Mexicans routed with great loss.” It does not feature Pillow or Quitman or any other particular general, but it is interesting because of the lack of anything resembling the actual fortress of Chapultepec. * “The Life and Wars of Gideon J. Pillow” by Nathaniel Cheairs Hughes and Roy P. Stonesifer, UNC Press, 1993. **”Agent of Destiny: The Life and Times of Gen. Winfield Scott” by John S.D. Eisenhower, Free Press, 1997. We last saw our hero at the battle of Cerro Gordo. 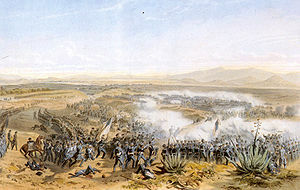 Despite Pillow’s best efforts to thwart the military might of the U.S. Army singlehandedly, the American forces continued their inexorable advance westward toward Mexico City, next clashing with their foes at the linked battles of Contreras and Churubusco, August 19-20, 1847. “Old Fuss and Feathers,” Winfield Scott, laid out the plan. General David Twiggs was to advance across the rocky slope of Mt. Zacatepec to meet the forces of General Gabriel Valencia. 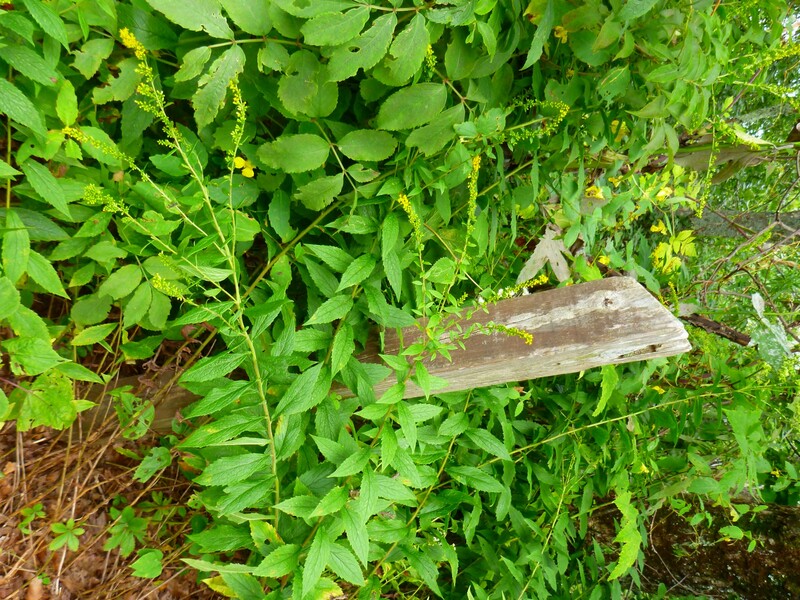 Twiggs was to “brush away the enemy in case he became impertinent,” and if the fighting became serious, Pillow was instructed to “support Twiggs with his whole division and assume the command.”* Twiggs did not much care for this arrangement, having fought in the War of 1812 and possessing much more military know-how than the “political general” Gideon Pillow, but Pillow technically outranked Twiggs (because of the support of his ally James Polk), and so the order stood. A soaking rain set in. From the heights of Zacatepec, Pillow set forth through the inky night with Twiggs toward a point called San Geronimo, north of Valencia’s position, so that he could arrange a “flanking movement” to entrap Valencia. The two became disoriented as they manuevered across the slippery volcanic rock. The two generals eventually emerged, not at San Geronimo, but on the far eastern side of the mountain, miles away from the scene of battle. Meanwhile, an enterprising colonel named Persifor Smith, working with Captain Robert E. Lee, had come up with a bold strategy to lead three brigades along a ravine toward the rear of Valencia’s position. Lee successfully crossed the rocky slope of Zacatepec and informed Scott of the plan. “Fuss and Feathers” ordered Pillow to stay put, Twiggs to create a diversion, and Smith to proceed with his plan. Smith’s attack began at 3:00 a.m. and succeeded brilliantly. Pillow arrived on the scene just as the Mexicans were fleeing. Clearly, now that the conflict had already become a success, it was once again time to “assume command.” Pillow spotted Colonel Bennet Riley, who had participated in Smith’s movement. Our general rode up to Riley and shouted, “You have earned the Yellow Sash, Sir, and you shall have it.” Somehow or other, Pillow had suddenly become the dispenser of these tokens of recognition. The Americans pursued the Mexicans across the Churubusco River. Forces under Pillow and Worth joined up with troops commanded by Shields and Pierce, and the Mexican resistance fell apart. It was time for the final advance to the gates of Mexico City. *All quotations are from The Life & Wars of Gideon Pillow by Nathaniel Cheairs Hughes Jr. and Roy P. Stonesifer Jr., UNC Press, 1993.